How are your survival skills? It's the late 19th century, and you're a young English aristocrat lost in the American Southwest. A lynch mob is after you for horse theft. Irritable natives are on your trail. And the woman with you is not the type you'd bring home to your mother. Would you survive long enough to find safety? Or would you curl into a fetal position and cry? 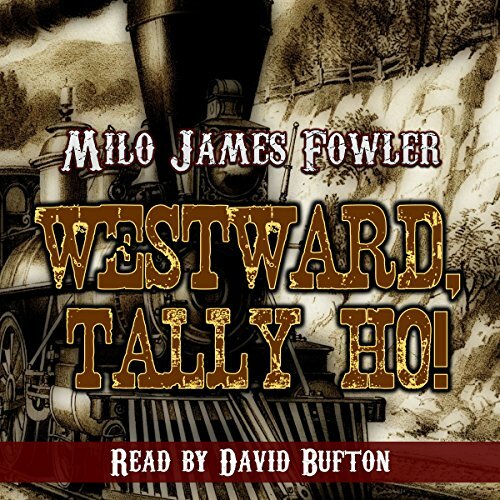 This is where Clarence Oliver Edwards finds himself in Westward, Tally Ho! Bored with his privileged life in England and weary of the relatives who share his family estate, Clarence follows his recently dismissed butler, Guthrie, on a non-stop adventure from the busy streets of Boston to the dusty trails of Santa Fe. What begins as Guthrie's search for his long-lost daughter becomes a shocking introduction to the American West for Clarence. His idea of proper etiquette is stretched to the limit as he's bombarded with characters of all types: tough gunslingers, seductive saloon girls, crafty frontier traders, an eccentric Zuni Indian chief, and a wild hermit. Through it all, Clarence realizes the value of loyalty and the cost of redemption. But most importantly, he discovers a degree of inner strength he never knew he possessed. Will Guthrie find his daughter? Will Clarence survive unscathed? Take a wild ride through the Old West and find out! Story line good, did Not like how the Native American were represented. The worst part was the narrator would simply Stop at the end of each chapter and then there was dead silence. I would check to see if device was not working, then finally the narrator came back stating Chapter ___ and go on. This was very disruptive to listening to the story. The storyline was basically good and the story silly but sort of fun. This is an enjoyable mix of British humor and the Old West of America. Young Clarence is bored, so he jumps at the chance to follow his Butler, Guthrie, on a sudden trek to America. Clarence doesn't have the faintest idea of why they are going or what they will encounter, but he's game for anything. Following in his father's adventurous footsteps seems like just the thing that Clarence needs. He soon finds out that he is ill prepared for what the West is all about. The train ride that takes them from Boston to Santa Fe is full of eye-opening characters and that is just the beginning. If you love British humor and you love Westerns, this is a good mixture of the two. You have the madam with a heart of gold, a crusty old hermit, a few bad guys, a gunslinger, and some crazy "Injuns". Living in New Mexico, I found the story fun, even though not historically (or geographically) accurate. The narrator does a good job, but I did notice the VERRRRY LOOOOOONG pauses between the chapters. It was a little distracting and I found myself checking to see if my Kindle had quit on me on more than one occasion. I got this book via audiobook boom and this is my voluntary review. This book was interesting and satirical. Just when I thought I was getting into a good story the satire came out. I loved that the main characters were of different stations in life but of similar dispositions. Even though the butler was not the main character he took the show for me. I loved that he not only found his daughter but his daughter and the real main character fell in love. Some of the scenes were very disturbing but I loved the last train ride and the way they were able to catch the train. That was a good scene and helped keep the 3-star rating I gave the book. Some of the scenes were too far-fetched for me. The narrator fit the story but left me hanging at times. When the scene of the main character and the lady riding into the desert and then falling off of the horse was described I was wide-eyed.with something, disbelief, what you actually wrote that or something. Just call this Wooster and Jeeves in the Wild West. Author Milo James Fowler writes fabulous farce. His narrator, David Bufton, provides precisely the correct (to this American's ear) accent to enhance delightfully the telling of the tale of a spoiled aristocrat and his stalwart butler in search of the butler's lurid past. Trains and horses, heroes and cowardly cravens, Indians and bad men, cattle towns and the arid western desert; all are portrayed from the viewpoint of the young adventurer seeking to follow in his father's well-journaled traveling footsteps. Plenty of western action overlaid with an eye to the absurd. Fun and funny!